A London-born actor, Mark Andreas Sheppard (born 30 May 1967) is mostly known for his television work. He's usually a single-episode guest star or a recurring bit player rather than a regular castmember, but his appearances are always memorable. Sheppard's roles tend towards the villainous, or at least the mysterious and morally ambiguous. (When asked, he'll mention with some pride that he's never played a "bad guy".) If your favorite show featured a sinister and slightly creepy-looking Englishman for a couple episodes, it was probably him. He is the son of legendary sci-fi genre actor W. Morgan Sheppard, and before becoming an actor he played drums for the Post-Punk band Television Personalities. Not to be confused with Brigadier General Mark Jamison Sheppard, the GDI supreme commander from Command & Conquer: Tiberian Dawn, or Mark Allen Shepard, aka Morn from Star Trek: Deep Space Nine. The X-Files: Cecil L'ively, a gardener who starts fires with his mind. Firefly: Badger, one of the crew's regular criminal contacts. Interestingly, he's playing a role there originally meant for Joss Whedon himself. Sliders: in Net Worth he plays a gang leader among the poor separated from the rich. Star Trek: Voyager: Leucon, father of Icheb. The Middleman: Manservant Neville, an environmentally-conscious electronics mogul who may or may not be evil. He totally is. Burn Notice: Tom Prescott, a bank robber who discovers that spies make bad hostages. Leverage: Jim Sterling, an insurance investigator who used to be Nate's coworker and close friend, now a Wild Card antagonist to the team. "Sterling never loses" is an official rule in the writers' room. White Collar: Curtis Hagen, a notorious art forger. Notable for being the show's first villain of the week, he later returned in the show's fifth season as its main antagonist. Battlestar Galactica: Romo Lampkin. Creepy and ruthless—seemingly even amoral—but still one of the good guys. 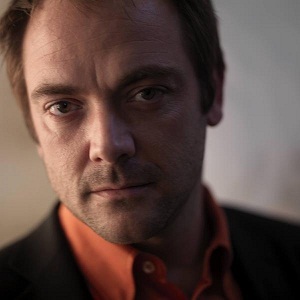 Supernatural: Crowley, leader of the Crossroads Demons and new Ruler of Hell. Wound up becoming one of the breakout characters on the show, becoming a series regular in the 10th season. Warehouse 13: Benedict Valda, one of the Regents, the shadowy organization that runs the Warehouse. The Conduit: Michael Ford (no relation to Nate Ford). Jake 2.0: Plays an American, a member of an Army Special Forces unit which has gone rogue, in the episode Whiskey-Tango-Foxtrot. Doctor Who: Canton Everett Delaware III, a recently ousted FBI agent brought back into the fold by Richard Nixon to deal with a seemingly impossible problem. Joined by his father in the same role but older. And notably one of the rare characters he's played who isn't an antagonist, jerkish Anti-Hero, or somewhere in between. 24: Ivan Erwich, a recurring antagonist in the first half of season five. The role was intended for Eddie Izzard, who quit after one day. Monk: A crooked gravedigger who happens to be the killer of the week, in an episode that was notable for being one of the earliest ones with Monk's second assistant Natalie. He also had a little trouble keeping his American accent in this one.